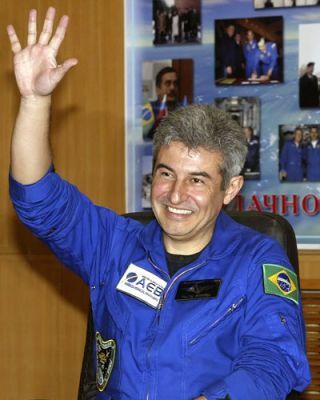 Brazilian Air Force Col. Marcos Pontes, his nation's first astronaut, waves during a prelaunch press conference on March 29, 2006. Marcos C. Pontes beamed ashe described his excitement on the eve of Thursday's scheduled launch (local time) from the Baikonur Cosmodromefor a mission to the International Space Station. Marcos said he felt a deepresponsibility to carry out the mission well, and wanted to take along thingsimportant to his Latin American nation. "I am taking the Brazilianflag - the most important thing that I am taking," he said. "Actually, I amgoing with the flag, not the flag going with me." Engineers rolled theSoyuz-TMA 8 out tothe launch pad on the Central Asian steppe on Tuesday as they went throughfinal checks ahead of the missionthat will carry Pontes, Russian Pavel Vinogradov and American Jeffrey Williamsinto space. The mission will include experiments designed to see how humansreact to prolonged space travel. Pontes will stay on the spacestation for nine days and will return with the currentRussian-U.S. crew on board the space station. Vinogradov and Williams willstay on board for about six months. Vinogradov, who is thecommander of the crew, said they will carry out over 65 scientific experimentsduring the mission. The American space programhas dependedon the Russians for cargo and astronaut delivery to the space station sincethe 2003 shuttle disaster.The shuttle Discovery visited the station in July 2005 but had problems withits foam insulation on its external fuel tank. It is expected to fly to thestation inJuly. The mission marks animportant moment for Pontes, who began training in 1998 in the United Statesand was scheduled to fly to the space station aboard a U.S. space shuttle.Those plans were scrapped after the U.S. National Aeronautics and SpaceAdministration suspended shuttle flights following the 2003 Columbia explosion. After the disaster, Brazilopened talks with Russia about having him blastoff on a Russian rocket. During a November 2004 visit to Brazil, RussianPresident Vladimir Putin also agreed that Russia would help Brazil resume its spaceprogram and restore its launch base, which was destroyed by a 2003rocket explosion that killed21 people. In addition to the flag,Pontes said that he would take up a jersey for his soccer-mad nation, which haswon the quadrennial international championship five times. With optimism, hepredicted it would honor the "six-time champions of the world, the Brazilianfootball team." The next World Cup finalstake place in Germany later this year.